In the South Lakes area, in addition to looking after lots of countryside and woodland, the National Trust owns houses that are let out to local people. 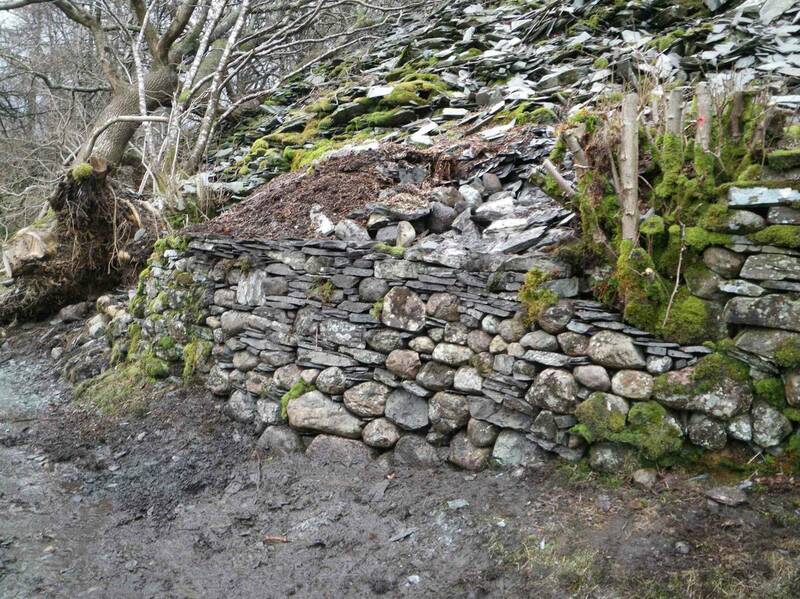 An interesting job recently undertaken by the Upland Footpath team involved working in the garden of one of these houses. This needed a different approach to our normal work due to the formal nature of a garden compared to the countryside. 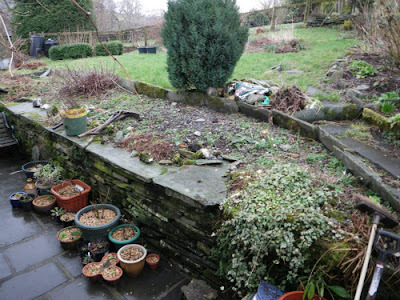 The existing garden did not have good access to the upper part of the garden. 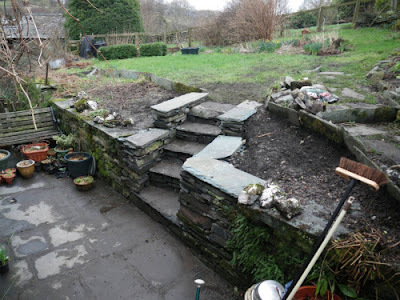 The solution was to build some ‘dry stone’ steps from the lower patio up to the garden. Slate for this was collected from a nearby quarry and used along with existing stone in the garden. 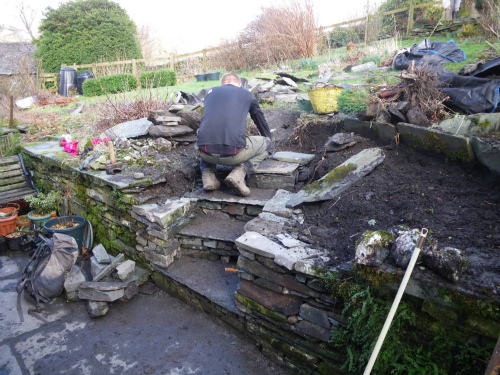 Almost all of the work was carried out by Ian, although Nick likes to think that the small contribution he made was crucial! 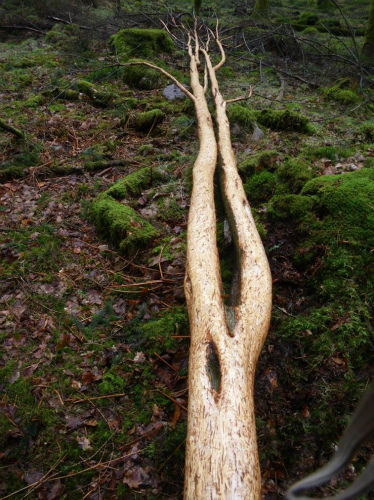 The photographs below shows bark stripped from trees in two of our woodlands. Bark stripping is a problem for living trees and, depending on the extent of the damage, may kill them. The fallen tree is quite striking as almost all of the accessible bark has been stripped. The explanation for this is deer (roe and red deer are both found in the Lake District) as they will peel and eat bark, particularly in winter when other food is scarce. Other animals, such as rabbits and squirrels, may have contributed to this damage particularly in the case of the fallen tree. Closer inspection can help determine what has caused the damage. For example, deer have no upper incisor teeth and leave broad teeth marks running up the peeled stem with torn or broken bark hanging at the top. The teeth marks from rabbits and squirrels are much narrower. So next time you see a tree with bark stripped take a closer look and turn detective! ﻿It’s been a varied week as usual, with numerous jobs completed! A large portion of my week has been office based, as I’ve been working on a number of projects, including working with contractors on a National Trust campsite development and planning work for our staff and volunteers in the coming weeks. This week Craig has been working on a mini-digger completing a number of planned jobs around our property, including important maintenance to our path network. The week started with an influx of new seasonal staff for the South Lakes property and I was a part of the induction day. 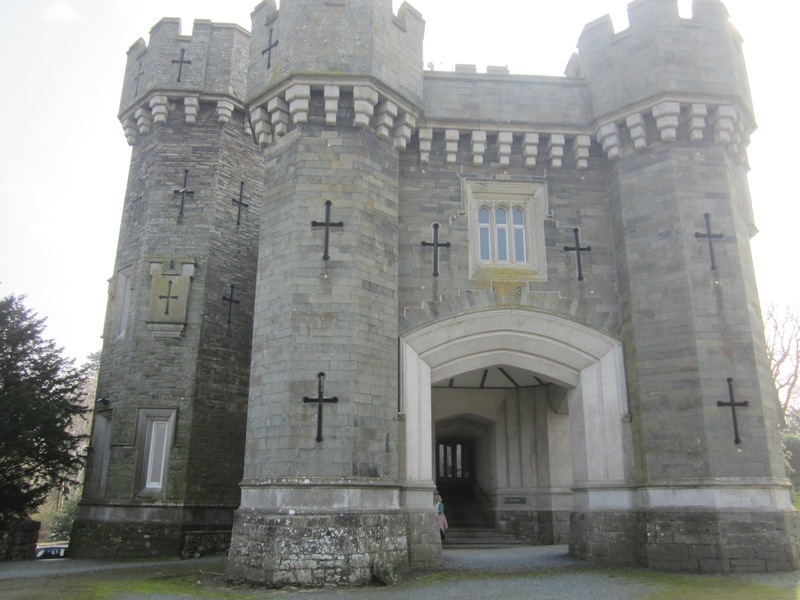 We began at Wray Castle with introductions to the National Trust and what Rangers do in the countryside, then it was off on a property tour! 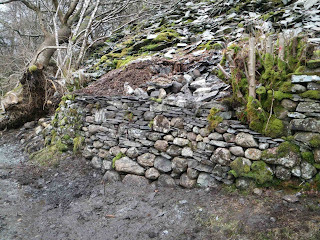 We visited Hill Top, the Beatrix Potter Gallery and Tarn Hows, before a tasty lunch at Boon Crag. Then we were off to Monk Coniston for a whistle stop tour around the restored walled garden and the impressive tree collection, whilst admiring the splendid views over Coniston Water. Wray Castle in all its splendour! In the outdoors this week I have had quite a variety of jobs! 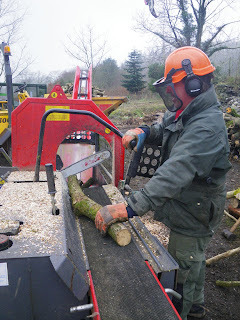 On Tuesday I helped Richard our woodland Ranger to move some rather large bits of a beech tree from a tenant’s garden, where a tree had been felled. This will then be chopped and then dried ready for burning in Hill Top Farm or our holiday cottages next winter. 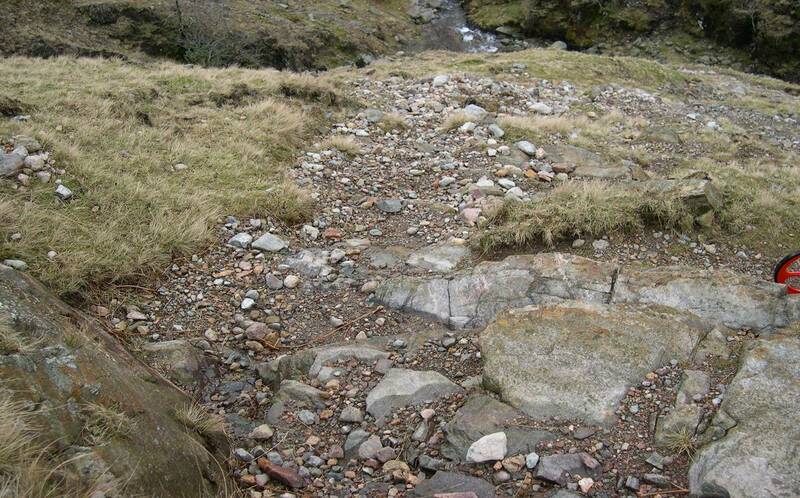 I have also carried out a safety briefing for users of Cathedral Quarry in Langdale and solved a drainage problem at a residents house. All in all it has been a challenging but enjoyable week, with the added bonus that Spring has arrived! After a very warm and wet winter spring is definitely not too far away now. There are one or two early woodland flowers cheering the place up and the promise of more on the way. When I walk through the woods here it's almost impossible not to notice the smell of wild garlic.Primroses have begun flowering, bluebells and cuckoo pint are showing through so it promises to be a colourful spring in South Lakes woodland. The birds are singing loudly now with males smartening themselves up for the breeding season, I have started hearing green woodpeckers 'yaffling' in the woods and greater spotted woodpeckers drumming on dead trees. 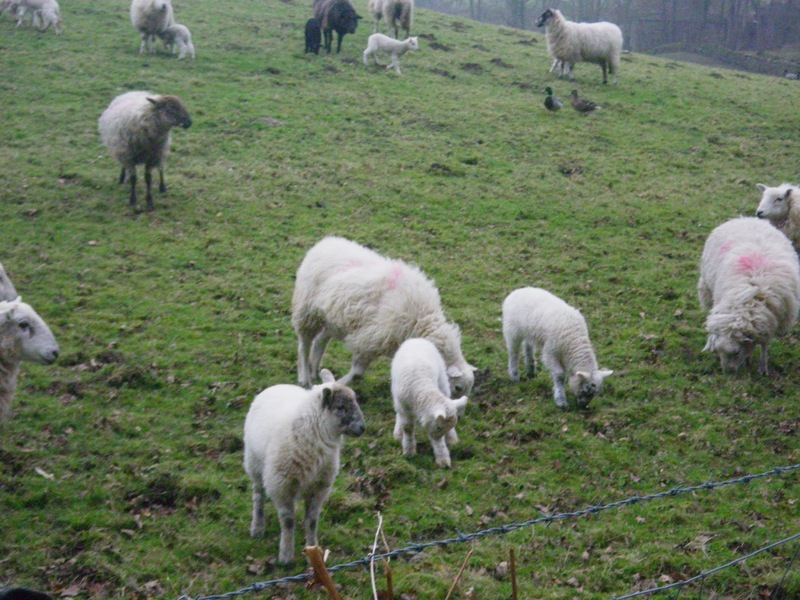 Some of the fields already have lambs in them but most of the fell sheep will lamb in April and early May. 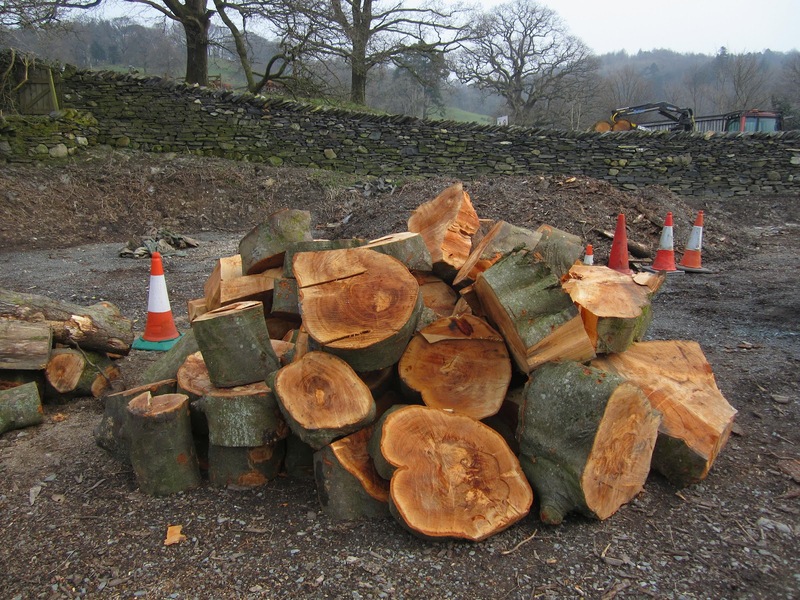 After spending a good deal of the winter coppicing along the lakeshore bridleway by Windermere we now have a large stack of timber in the yard. 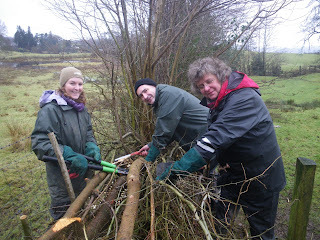 We have borrowed a firewood processor from Sizergh Castle and we are making headway into the stack. Burning wood may not appear to be very eco-friendly, but only the carbon dioxide absorbed when the tree grows is released when logs are burnt so we are not adding to greenhouse gasses, the timber comes from sustainable woodland management of the Trusts woods - wood does grow on trees after all! 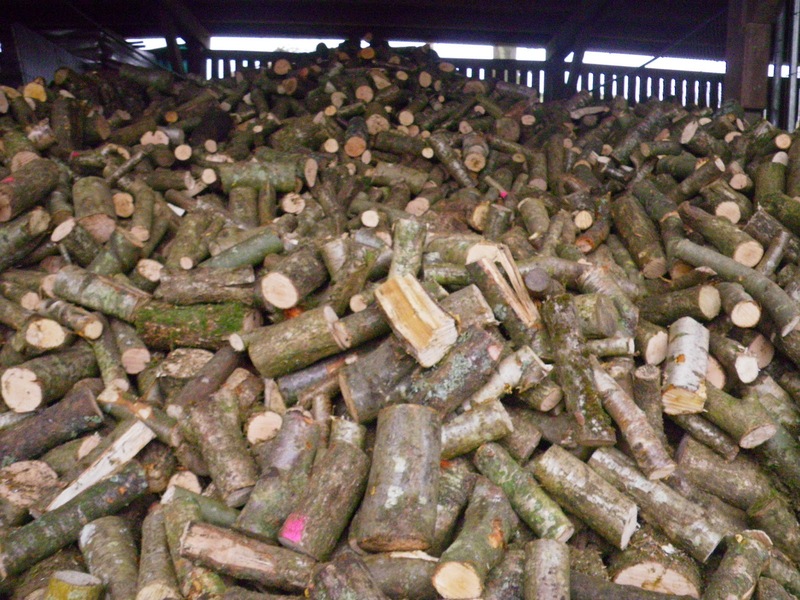 Timber felled in the winter needs time to season, so we have been cutting and splitting it and loading the wood into a drying shed which will keep the weather off and allow air to circulate which speeds up seasoning. By this winter we should have a shed load (literally!) of seasoned logs. 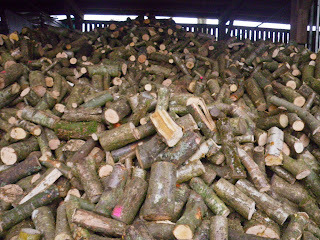 A shed load of logs! Ambleside uni getting to grips with the details. 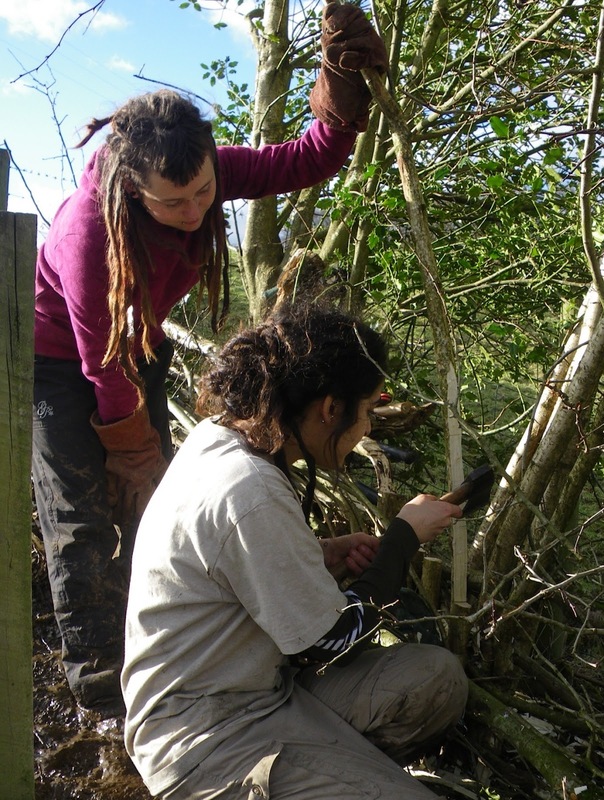 How many volunteers does it take to lay a hedge? Our 'day groups' as we call them (clever eh?) normally come on the same week, with a different day each. A recent week saw groups from Ambleside campus of the university of Cumbria, Kendal College, Littledale Hall Therapeutic Community (a residential drug and alcohol rehabilitation centre), the South Lakes Conservation Group and the Fix the Fells voluntary lengthsmen all work on the same stretch of hedge. 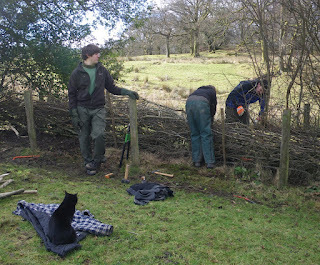 Littledale Hall weaving the hedge together. 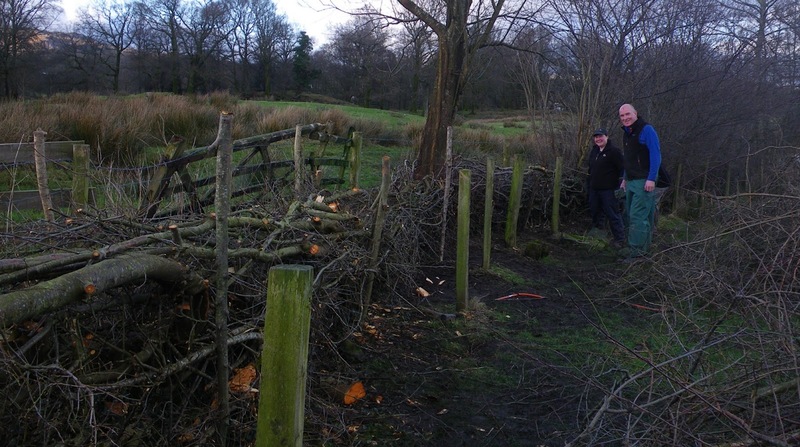 Some of these groups such as the SLCG and Lengthsmen have done quite a bit of hedgelaying with us over the last few years. The ﻿students though were trying it for the first time (although the same black farm cat that joined us last year arrived again to offer it's experience to Ambleside Uni) as were the group from Littledale Hall. The lengthsmen by their finished section. By Rob Clarke, Basecamp Community Ranger. 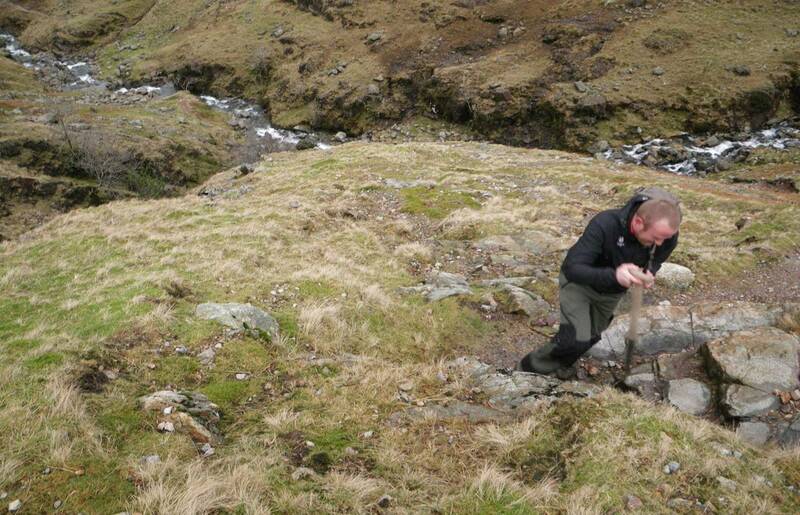 Two different tasks by the paths' team this week highlight the range of our conservation work in the local landscape. 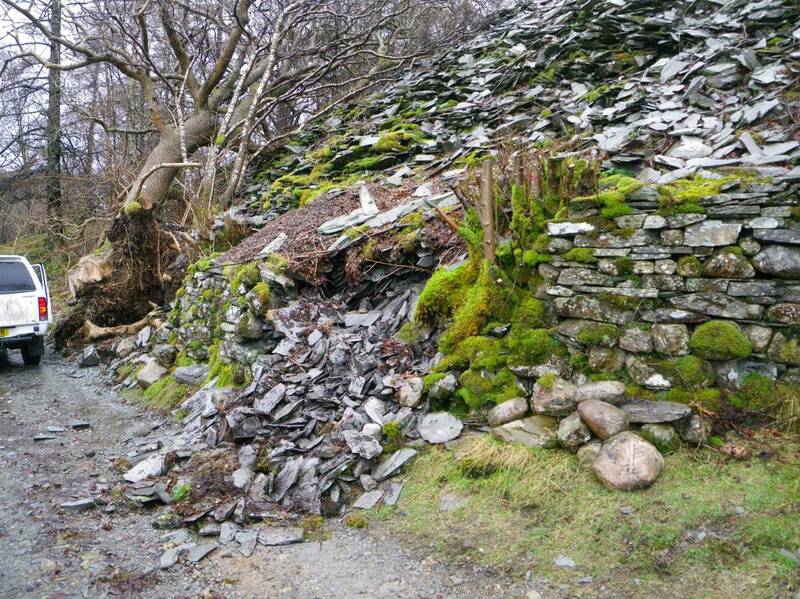 The first was repairing a collapsed retaining wall at Hallgarth in Little Langdale. The gap itself was relatively small but the amount of stone it was holding back was VERY big! 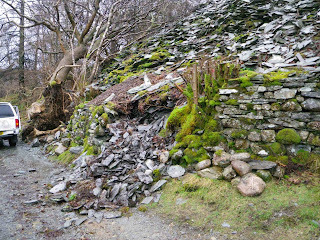 Part of the industrial history of the area, the pile of stone is old slate quarry waste that was dumped there over half a century ago and the wall was built to keep it in place. We think the wall may have come down due to the tree that fell. Here it is before and after our work. The hardest part of the job was removing the stone from where the wall had fallen because of the slate above continually filling the gap that you’re trying to clear. The job reminded me of a certain kids' game that involves pulling out wooden blocks from a stack without it falling around you! We managed to get the wall up without too many problems. Thanks to volunteers Glen and Trevor who gave up their time to help complete the job. 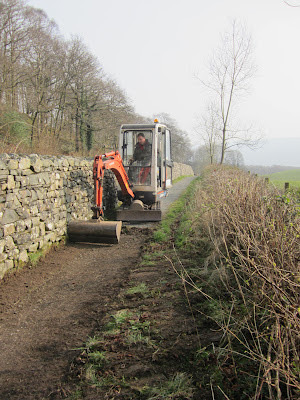 Now the snow has disappeared we were able to get back to the regular maintenance of the upland path network. 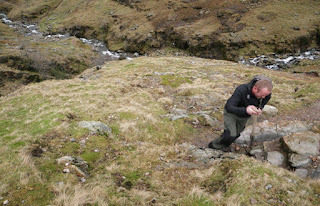 We re-visited a footpath we worked on over a year ago in Langdale at the very appropriately and splendidly named Hell Gill. Here it is before and after. 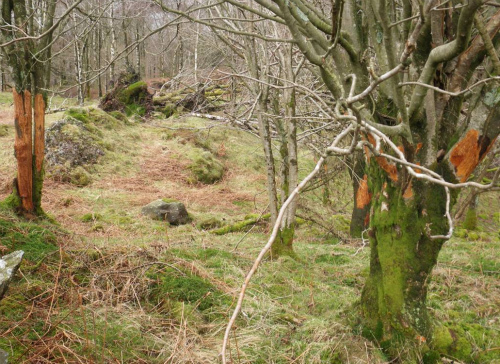 On one of the steeper sections, people were short-cutting the path and so eroding the hillside. We worked on trying to get people back on to the path using subtle methods and as you can see we’re now winning the battle here. One down, plenty more to go!